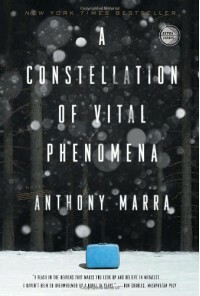 After Anthony Marra finished his first draft of A CONSTELLATION OF VITAL PHENOMENA, he printed it out and started re-typing the entire thing. He did this after typing the second and third drafts, too. He typed this entire novel, cover-to-cover, four times in total. To say he is worthy of all the awards he has received would be an understatement. This is a beautiful, potentially life-changing novel, well-worded and exquisite throughout. Marra said his goal was to produce laughter and tears within the same page. To an extent, yes, but don’t go expecting rainbows, kittens, and butterflies. This is Chechnya circa 2004. People here are identified by which body parts are still intact. If you have all ten of your fingers, you are a rare and beautiful specimen. The scene is grim, but Marra is right, there’s still plenty to smile about. Despite feeling third world (the high value of an autograph of a formerly fat person; Soviet constructed toilet bowels covering unexploded bomb shells) this novel paints a contrast with the mysterious modern world outside of their grasp (is the President of America Ronald McDonald? ; what is this Amazon that underworld members can produce books from?). It may feel old, but the real tragedy is the life-altering wars that take place in our world today…so many ignored. The stories tie together to paint the beauty of life and the importance of family. The title is taken from one character’s medical journal, under the entry for “life”. Life is defined as, “a constellation of vital phenomena—organization, irritability, movement, growth, reproduction, adaptation.” This is shown throughout Marra’s book. The characters evolve with growth. Though their livelihoods are torn asunder, their spirit holds fast to that which is most precious: their hopes, their futures, and their family. Even the most apparently vial of characters has something to share. Though the flashbacks may at times seem irksome, they are excellent tools that reveal some of the most surprising secrets. And though not the most happy of endings (again, Chechnya circa 2004), the way the author ties it all together is one of the most unique methods I’ve seen employed. This is an emotionally moving masterpiece in the hands of a skilled author.